For the past four years, a University of Texas at Austin postdoctoral fellow Tim Goudge has been making the case to send an upcoming Mars mission to Jezero Crater. 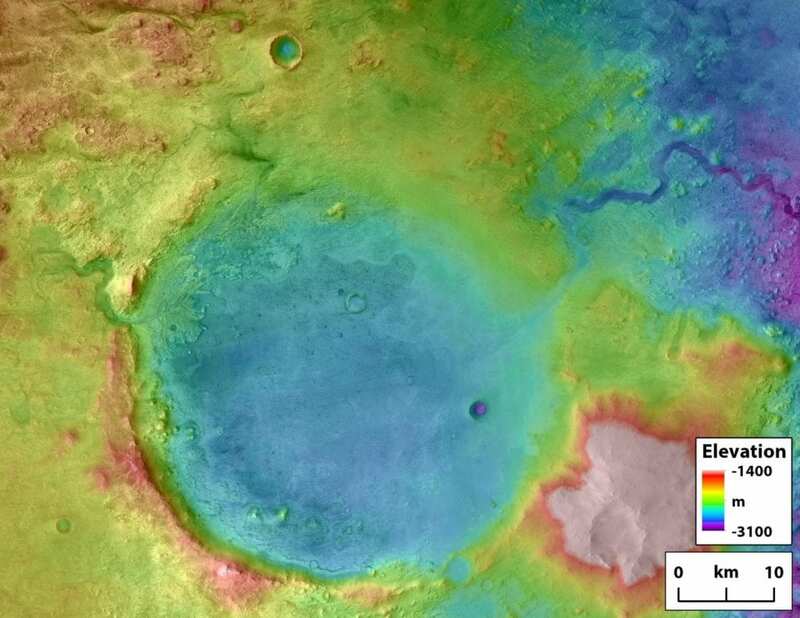 On Monday, Nov. 19, NASA announced that the crater–the site of a former lake and river delta–will be the landing site for their Mars 2020 rover mission to look for signs of past life. NASA considered more than 60 candidate locations across the Red Planet. Thomas Zurbuchen, associate administrator for NASA’s Science Mission Directorate, announced the decision to send the mission to Jezero during a public teleconference. Goudge and the rest of the scientists who submitted site proposals found out about the selection during this announcement. “They kept their cards close to their chest,” Goudge said. Jezero is a 28-mile-wide impact crater located on the western edge of Isidis Planitia, a plain that’s placed within a larger impact basin just north of the Martian equator. Today Jezero is an empty basin. But billions of years ago, it was the site of a lake and river delta where flowing liquid water emptied into the crater. The sediment deposited by the river could preserve signs of life that might have called Jezero home eons ago. It’s the goal of the Mars 2020 mission to seek out those signs in rock and soil samples and store them so they can eventually be brought to Earth. Goudge’s research focuses on how rivers and lakes modify landscapes on planetary bodies–including Earth and Mars. He proposed Jezero Crater as a landing site for the Mars 2020 mission in 2014 when he was a graduate student at Brown University. Throughout the landing site selection process Goudge has been the lead advocate for Jezero. He presented on Jezero at the first two NASA workshops assessing potential landing sites. By the final two workshops, a team of scientists had joined Goudge in making the case for the crater. In a 2017 workshop, Jezero was voted the top landing site contender by scientists attending the meeting. While acting as an advocate, Goudge has also continued his own research on Jezero using orbital images of the crater collected by the Mars Reconnaissance Orbiter. Last week, the journal Geology published a study led by Goudge that found that massive floods bursting from crater lakes, including Jezero, had carved outlet canyons in a matter of weeks. Goudge hopes to play a role in the Mars 2020 mission, with NASA planning to issue a call for mission experts at a later date.